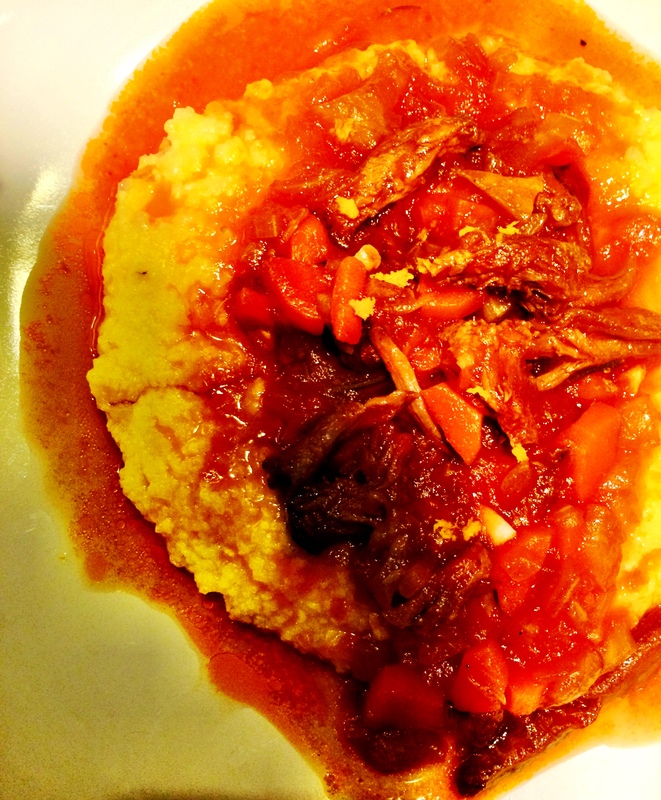 I first fell in love with oxtail when I had an oxtail cuttlefish ragout over polenta at one of my all-time favorite restaurants, al di la Trattoria in Brooklyn. It’s a cozy restaurant in Park Slope serving northern Italian fare, and the food is nothing fussy, but simply delicious. They say that the meat closer to the bone has the most flavor, and that’s why oxtail is so delicious. It’s an odd cut (it is the actual tail), but it lends itself well to long and slow braising. In my own version of oxtail ragout, I made a Mediterranean version of the traditional Roman coda alla vaccinara and added fennel (because I love fennel), rosemary, and a little orange zest (adds freshness to the rich stew). The key to this dish is browning the oxtail to build as much flavor as you can before adding the vegetables and wine. The oxtail does not yield a whole lot of meat, but makes up for it in flavor. 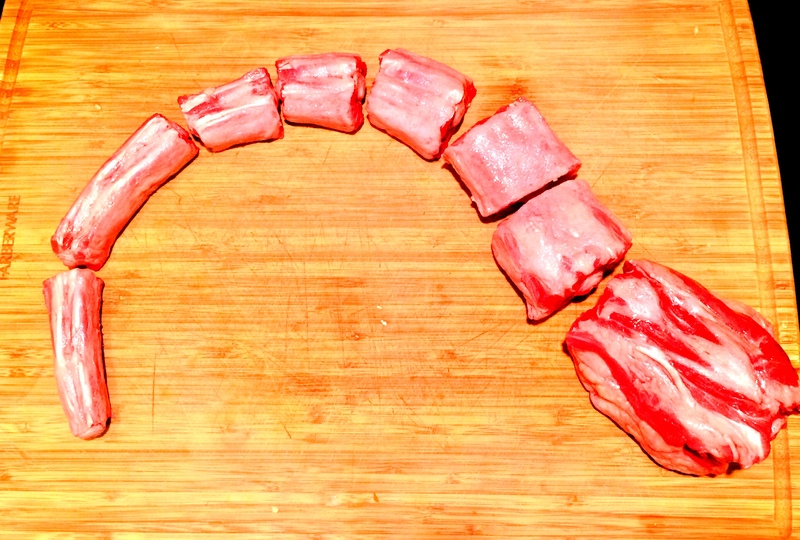 Pat the oxtail pieces dry, and season with kosher salt, pepper, and orange zest. Heat 1-2 tbsps. of olive oil in a large Dutch oven over medium high heat. When the oil is hot, add the oxtail pieces. Depending on the size of your pot, you may need to do this in 2 batches to avoid overcrowding. Brown the oxtail pieces on all sides. It takes about 10 minutes in total. Remove the oxtail pieces and reserve. Add the onion, fennel, and carrot to the pot. Add a dash of salt and stir, picking up the brown bits on the bottom of the pot. Add the chile and rosemary sprig, and cook until vegetables are softened, about 10 minutes. Add the garlic, and stir for another minute. Add the wine to deglaze, and cook until most of the wine has evaporated, about another 10 minutes. Add the tomato puree, and mix well. Return the oxtail pieces to the pot, and add the beef stock. If the stock does not cover the oxtail, add a cup or two of water. Bring to a boil, then reduce the heat to low. Cover the pot most of the way, and cook over low heat for about 2 hours, stirring occasionally. Remove the lid, and remove the oxtail pieces. 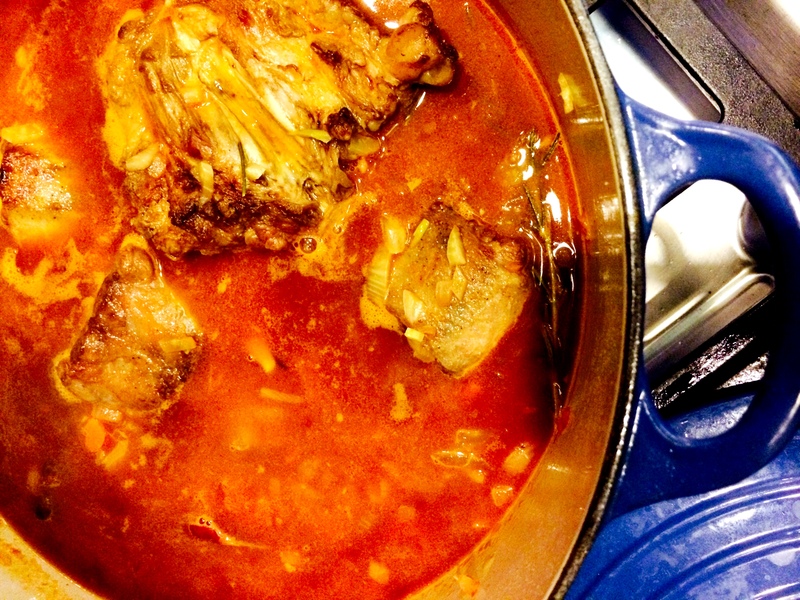 When cool enough to handle, peel the meat off of the oxtail bones, and return shredded meat back to the pot. Discard the bones. With the lid off, the sauce should be reducing while you are working on the bones, and it is done when it looks more like ragout than a soup. It took me about 30 minutes. Remove the chile and rosemary sprig, and season to taste with salt and pepper. Cook the polenta according to package instructions. 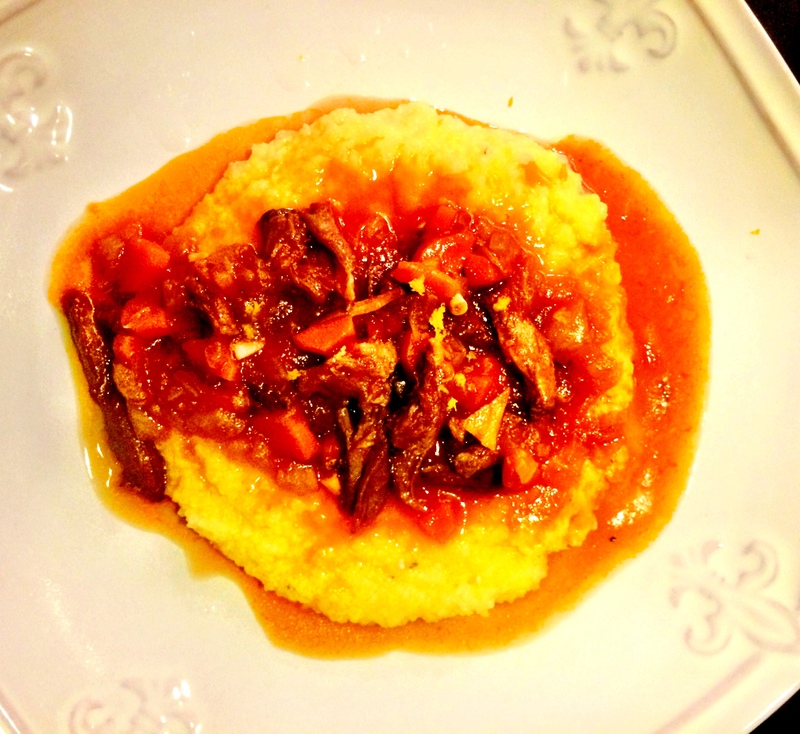 Serve the stew over the polenta, and top with a few gratings of orange zest.